Does your business rely heavily on email for your day-to-day operation? If it does, our SPAM-filtering will help you reduce risk and save money! Security, Productivity, Deliverability, and Reputation! Unmanaged SPAM isn’t just an annoyance in a business-critical email environment. It costs money, time, and is potentially dangerous. The distraction of junk mail and SPAM forces people to stop what they’re doing and it wastes their valuable time. If email users spend just 10 minutes a day reviewing messages that shouldn’t be in their inbox, this adds up to nearly a full week of lost productivity in a year. If you multiply that lost time by the number of employees using your email system, your company will have a significant hidden expense that can add up to tens of thousands of dollars each year! But, there are even more important factors at stake. Malicious activities such as phishing for information, plus virus and malware delivery through email can do serious harm to your business if left unchecked. In most cases, the built-in SPAM functionality of today’s email systems is not nearly enough. 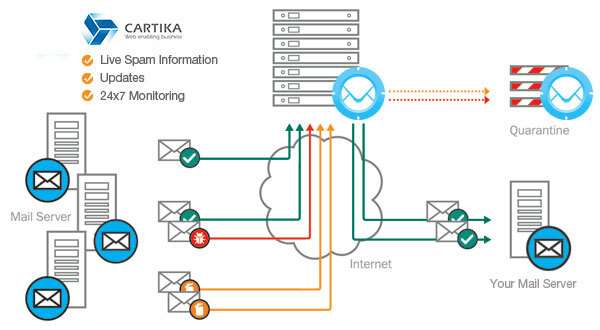 Using Cartika’s enterprise-grade SPAM-Filtering-as-a-Service makes your email system more secure, productive and effective! Outgoing filtering also protects your company from being blacklisted by monitoring what goes out. Eliminates the valuable time your employees spend sifting through unwanted transactional, mass marketing and promotional email. 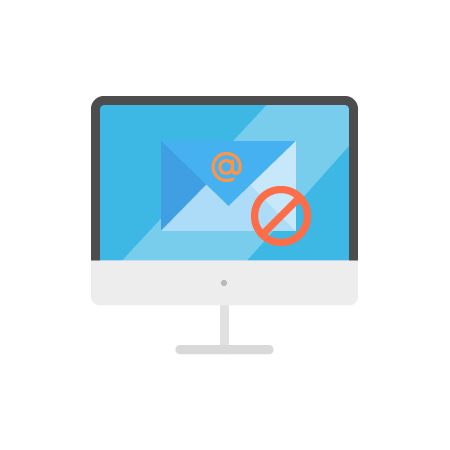 Easily stops incoming messages from bulk or Email Service Providers (ESP) that are not relevant to your business. Filters out pure SPAM messages, inappropriate, and offensive content. Gives you full control over domains you choose to accept or reject. If your email server is down, our appliances spool and safely store your emails until your system has been restored. Once back online, all messages will be delivered to their appropriate inboxes. You never need to worry about missing a message. Our industry-leading SpamExpert appliances are geo-located. In the unlikelihood we experience an issue, the filtering is re-routed instantly to redundant locations. This high-availability model keeps your email system running smoothly at all times. Our appliances all have large, dedicated IP address pools that are exclusively used for email purposes. These IPs are highly reputable which means reliable delivery. Users receive daily digests to make sure legitimate email is not caught in the filter, plus they can“train” their individual mailboxes as desired. Outbound filtering is available to ensure your company maintains a good reputation for your email server IPs. Many don’t think about this, but what you send out, can be as damaging as what you receive. Direct access to inbound and outbound email logs for determining the state of any given message. Near-100% incoming email filtering accuracy with near-0 false positives. Secures your network and IP reputation through outgoing email filtering to prevent blacklisting. Use the service with your own in-house email servers, with Cartika’s hosted solutions, or even email systems hosted with other providers. Fully scalable and includes support for up to 100 users – contact us for pricing if you need more. Choose between inbound filtering, outbound filtering, or both. We provide an intuitive control panel for fast and easy administrative control. A key advantage of our SPAM-Filtering-as-a-Service solution is the price. All the benefits listed above only cost $13 or less a month for an entire domain. This is not “per-user” pricing that many other providers offer, resulting in significant savings over comparable solutions! No hidden fees or volume caps to worry about. Manage your entire account through our powerful billing portal. Configure or modify your server in minutes. We proactively monitor all IPs in the outbound SMTP pool and instantly react to any issues or listing events that may arise. As with most of our services, support is included at no additional charge. SPAM-Filtering-as-a-Service (SFaaS) is an essential ingredient for maintaining consistent, business-use email delivery. Email domain users sending unfiltered mass messages can be perceived as SPAM by recipient mail servers. This can tarnish the reputation of your domain as a trusted source, and potentially lead to blacklisting. The net result will be delivery issues for emails your users send as part of their day-to-day business. The outbound filtering capabilities of our SFaaS solution protects against future delivery disruptions by prohibiting users from sending mass marketing communications or any messages considered SPAM. Given the complexity and control challenges associated with email systems, Cartika (or any other vendor) can’t possibly support issues related to deliverability unless outbound filtering is part of the solution. To ensure your business-grade email system is fully protected, consider switching to Cartika’s Cloud Email service. Among many other valuable features, it includes SFaaS and full 24×7 live support. If you manage a single email domain that is not part of Cartika’s Cloud Email service, you can add SFaaS for the low prices quoted above. For clients or resellers hosting multiple email domains not part of Cartika’s Cloud Email service, we offer a cost-effective SFaaS option that will cover all domains on your Cartika server or virtual machine. Control all inbound and outbound email traffic with SFaaS for only $150/mth. per server. This includes support for up to 500 email domains and an unlimited number of users. To find out more, contact us now!